In 90s, when people were fascinated with the idea of swapping out RAM and other hardware, it was great fun to tweak computers to boost their performance. Today, mobiles have replaced desktops in many areas and software has pushed hardware to the back seat. For example, we use virtual machines instead of hardware, which only reflects on how much we love the convenience offered by our software. 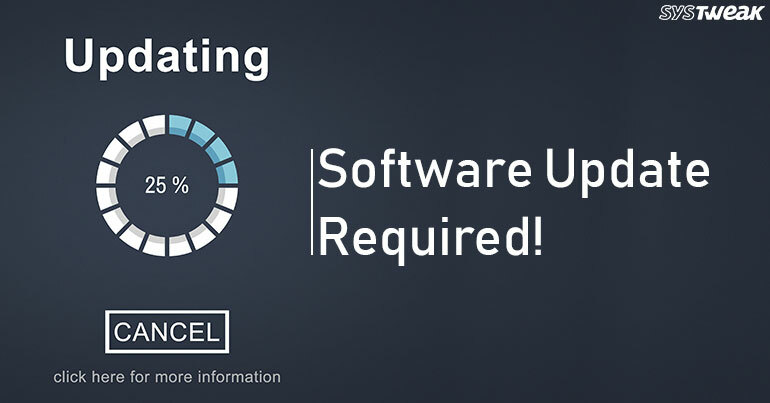 We or our businesses are too dependent on software and that’s why it is important to update our software timely. Cyber security attacks have grown in the last 15 years. They aren’t slowing down and are only creating new vectors for attackers to compromise your system’s. Today, any software if running, is prone to attacks. In a shocking revelation, Equifax recently reported that data like home addresses, birth dates and social security numbers of more than 143 million users in the US were leaked. Sadly, the prevention of the attack was already distributed as a software update three months before the attack but, Equifax did not care to update their own software. There are so many incidents that could have been stopped if users had installed the updates. It is better to update our software than to procrastinate. Why Do You Install Updates? Security: The above mentioned incident and other points reflect on how important it is to update a software to keep our machines secure. Updating software will always lessen the possibility to get attacked. Stability: Updates are not only required for security. Your software needs them for increasing its stability and save itself from other types of break down. Compatibility: Certain new hardware don’t allow software to sit on them. To remove these compatibility issues, software publishers come up with updates from time to time so that their users don’t face any problem using software with the new hardware. Thus, if you want to keep using your software on different hardware, old or new, it is strictly recommended to keep your software up-to-date. Choose the ‘Auto-update’ option for all software on both desktop and mobile devices. If the software does not come with the ‘Auto-update’ feature, set a reminder to check for and install updates periodically. Always read other user reviews before installing any software. Again, install software from trusted websites and online stores. Read newsletters and articles to keep yourself updated about the latest cyber threats. Therefore, you will know how to deal with the threat if you are attacked. Update your driver software if updates are available. You can install a driver updater tool to perform the task. Remember! Updating software will protect your devices from the latest cyberattacks. We hope we could convey the importance of updating software to you. If you have any doubts, or would like to share any additional information, feel free to post in the comments section below. How To Use Your Unused Smartphone As Security Camera?